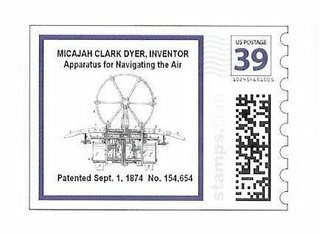 A new 39-cent U.S. postage stamp has been printed to honor Macajah Clark Dyer for his invention of an “Apparatus for Navigating the Air.” The stamp shows the front view of Dyer’s flying ship as depicted in U.S. Patent, No. 154,654 issued to him on September 1, 1874. 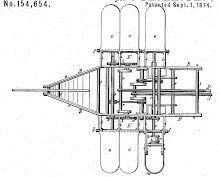 Clark Dyer designed, patented, built and flew his machine in Union County, Blairsville, Georgia, during the late 1800’s, decades before other inventors were able to achieve controlled air navigation. The stamp was designed by Dyer’s great-great granddaughter, Sylvia Dyer Turnage. 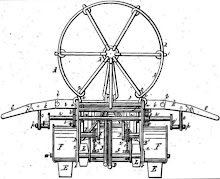 It has been entered into competition for display at the Smithsonian Institute in Washington, D.C., beginning August 2007.